THE suspect in the murder of a teenage girl and her grandparents in Canlaon City, Negros Oriental, was arrested at his hometown in northern Negros Occidental, Monday night, February 8. Roberto Montano Jr., 29, of Barangay Quezon, San Carlos City, is the prime suspect in the killing of Virgilio Tabanao, 61, his wife Erlinda, 69, and their 15-year-old granddaughter, whose name is being withheld by the police, at their home in Sitio Alibabay, Barangay Mabigo. The suspect is the foster son of the elderly couple. They met him at a church two years ago. 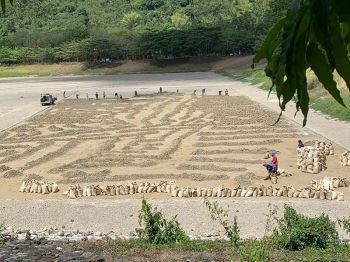 Superintendent Frankie Lugo, head of the Canlaon City Police Station, told Sun.Star Bacolod that the suspect was cornered in a ricefield at Sitio Borlad, Barangay Quezon at around 9 p.m.
Lugo said the suspect did not resist as he was arrested more than a day after the bodies of the victims were found. Police found the suspect's motorcycle in the barangay three hours earlier. Lugo said the suspect was sighted at Salvador Benedicto Monday morning, and they coordinated with the town police to track him down. Along with the police stations of Murcia and San Carlos, they set up checkpoints. A photo of the suspect was also released to police stations in the province. As of press time, the suspect was being transported back to Canlaon City. 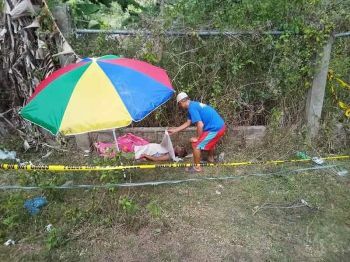 On Sunday afternoon, the bodies of the victims were discovered by two children who passed by their house, which was isolated from their neighbors. Lugo said the bodies were in advanced state of decomposition. He believed that the victims were killed on Friday, February 5. The elderly woman was naked when she was found in a ravine just outside their home while her husband was found on the front yard. Their granddaughter, who was almost naked, was killed in the living room. They all bore stab and hack wounds. Lugo said they are still waiting for the autopsy results to determine the exact cause of their deaths, and if the girl was sexually abused. He added that the suspect had a deep desire for the teenage girl. “There was a time he was caught peeping on the minor while she was taking a bath. He was reprimanded by the elderly couple for what he did,” Lugo said. Criminal charges are now being readied against the suspect. Meanwhile, Senior Superintendent Harris Fama, officer-in-charge of Negros Oriental Police Provincial Office, lauded his men for the arrest of the suspect. “I commend them for their immediate action. Hindi talaga nila tinantanan hanggang sa mahuli ‘yung suspect (They didn’t stop until they caught the suspect),” he said.